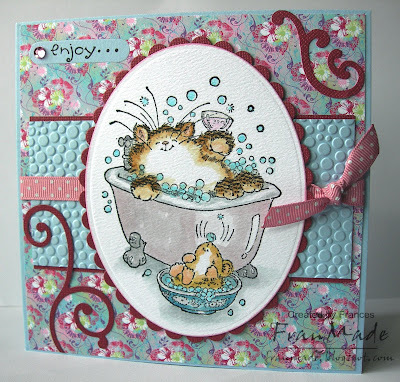 If you take part this week you will be entered into draw for a prize which this week is 2 fab new stamps donated by Katharina from her new range of stamps. Which ties in neatly with my other bit of news/info. If you've not already been, 'Whiff of Joy' is now taking pre-orders for the Charlie & Charlotte range of stamps. So go on over and have a look, I'm sure you'll not be able to resist, especially as it's FREE shipping if you pre-order now. It's so exciting seeing myself on the DT page of the website; I'm not sure what's given Katharina the idea that I have that much craft supplies - she must have been talking to my hubby, I'm sure I don't have THAT much, honest! Love how she's made all our photos black & white - it looks really professional, just hope I can come up with the goods now :/, should be soon! Hopefully I will have a Wii console and Wii fit to play with later today. I'm not much for going to the gym etc but have really started to put weight back on since I've gone 'part-time' (some of my clothes are starting to feel a bit 'snug'!) so need to do some excercise but knowing me it has to be something which I will actually do and at home. So being the big kid that I am we thought we'd get the Wii as it looks fun. I'll let you know how I get on! Anyone else tried it? 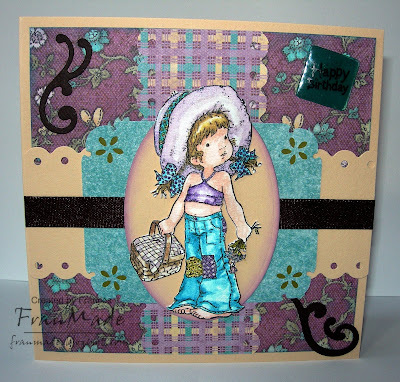 Theme this week for the ATCs is 'beads'. The only beads I have are some micro beads I've had in my stash for years so thought I'd give them an airing. Used Edwin with paddling oar which I had cut out previously and replaced his oar with a present but then didn't use him. So grabbed him as I made this late Mon night and needed something quick. Not one of my favourites as I'm not actually that keen on the paper but I'm hoping it will grow on me yet. Right need to try and get my DT stuff done now as I'm out tomorrow and know I will be short on craft/blog time again this week. Have a good night/day depending on when you're reading this! 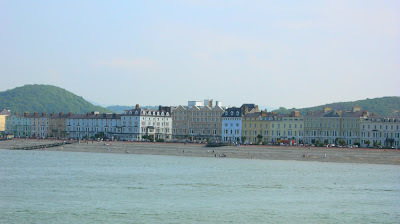 Further along the coast was Llandudno where we ended our day at the beach (it was sunnier but photo didn't turn out right! ): Going to have a rest now and think about cards some other day but if the weather continues to be so nice it's going to be tough to stay in and make cards! 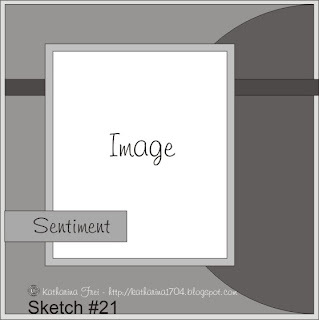 Another fab sketch by Katharina this week over on PTW . Used another one of my Sarah Kays for this as I haven't managed to use them all yet and thought I'd go for a more bright/modern colour scheme for a change (even though I still do prefer these images with the distress/vintage colours and schemes). to you. Make sure you link to their site in your post. their lives fully with generosity and joy. 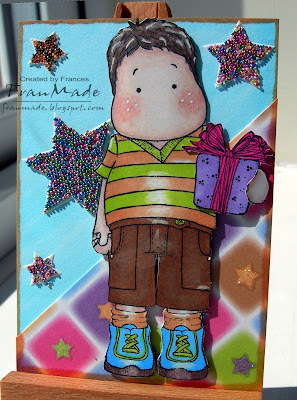 Colouring: Tim Holtz distress inks and cosmic shimmer paints. Just realised I've not added my white gelpen highlights - will have to do that later. Told you it was late! 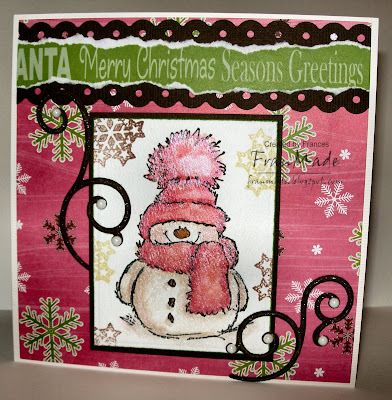 Paper: Papermania 'naughty & nice' christmas paper pack. 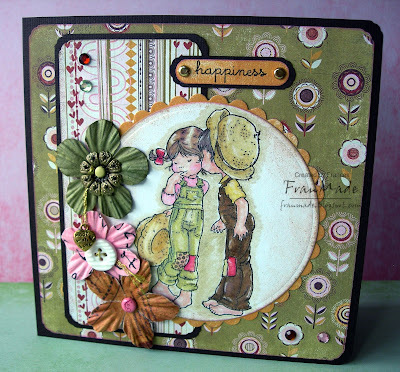 Love this pack as it's pinks, browns and greens. the packs this year are thicker weight paper too. Others: border made with my fiskars threading water border punch which finally arrived today along with the quickcutz flourish die - yeah been waiting ages for these. pearl gems from stash. CCT theme this week is 'things that grow'. 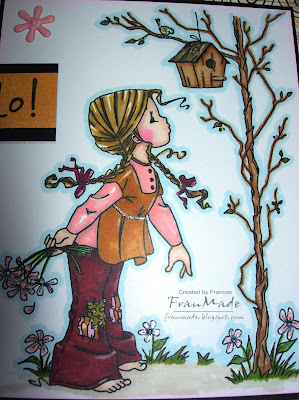 Well, people, trees and birds grow so I used another one of my fab Sweet art ebony stamps. Short on craft time this week, what with my sister visiting, so used the scraps on my desk which was just enough to make a quick kickstand card. Others: flower brad & ribbon from stash. Scallop border made with quickcutz border die and my cropodile. I did order the fiskars threading border punch over a week ago but still not here yet. Also, need to say thank you for all your comments and I'm not ignoring you all but just not glued to my pc like I usually am but will try and catch up with everyone soon. 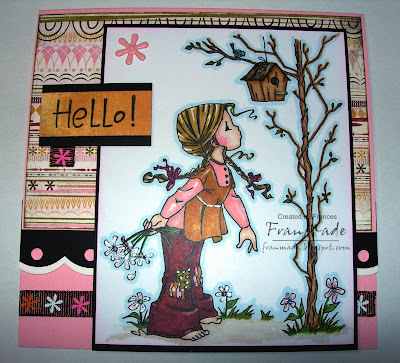 However did manage to do a quick scan of a few blogs (just didn't stop long enough to leave comments) and you must stop over at Katharina's for more sneek peeks of her stamp range designed by the fab Elisabeth Bell. Just a quickie from me today. Theme this week is buttons. Managed to find a rolling pin button in my stash so just put that with my apple pie Tilda and a bit of scrap dp and voila. 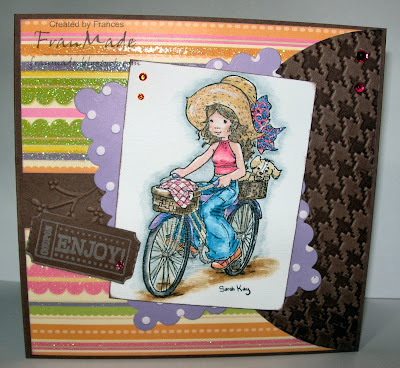 All details for making an ATC and the candy on offer can be found over on the ATC challenge blog, along with all the other fab DT creations. So hop on over and join in. Why not get the kids to make one too as there will be a prize for under 16 entries as well. I'm afraid no cards to show as I've been out all day and my crafting output will be a bit more erratic for 2 weeks so bear with me. 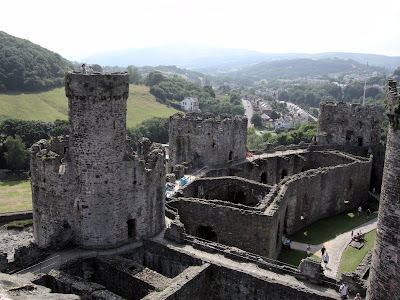 I did manage to tidy up my blog last night (wanted to update my bloglist to the one that tells you when they were last updated. Am hoping it will make my bloghopping time efficient as I can see who has updated, when!) 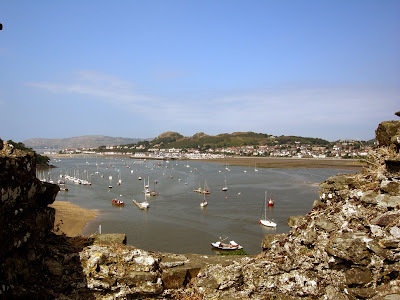 and whilst I was at it thought it was time to do a bit of redecorating so changed my colour scheme, made a new blogheader and put a new photo up. Quite simple really it is a way of saying thank you to those who take time out for wonderful comments to boost your day. Camilla would be my "recently new, in another part of the world person"
OMG, just look at this!!!!!!!!!!!!!!! 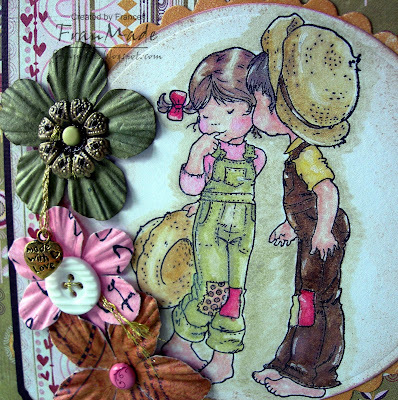 Finally had to play with my new Sugar Nellie stamps where Elisabeth has outdone herself with her gorgeous designs for the 2nd batch of Sweet Art Ebony releases. I had to get them all but so far have only managed to colour this one in! 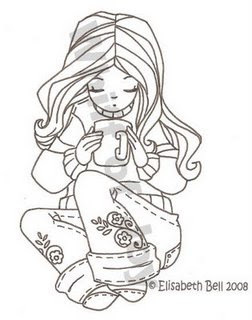 Image: 'Penpal' from 2nd release of Sweet Art Ebony range of Sugar Nellies. 'Love' studio g mini 99p clear stamp sets. dotted pink border an old Woodware clear border set, lost the packaging so don't know the name! Think she is my favourite of the new ones (although the birdhouse runs a close second), she's so pretty & sassy! So it definitely fits in with this week's spoonful of sugar challenge 'one for the girls'. It's another folder card, so will be used to house some images for one of my candy winners if I can bear to part with it as I love the colours on this. Anyone else have problems parting with their cards, or is it just me LOL?! Thanks for all the lovely comments and congratulations on my DT post. I'm still sooo excited by it all and can't wait to start! Have a great Saturday. The sun finally came out today but boy is it windy! Smell of exciting news in the air!. . .
O.K I've been bursting to say something but couldn't but now I can! What am I blabbering about? Well if you've visited Katharina recently (who I'm sure is on most people's blogroll!) you'll know her exciting news which means I can announce mine! I've been dying to post all day but not had a chance till now! Congratulations girls and thank you so much Katharina! Here's hoping we can play some small part in helping you make your dream business a success! 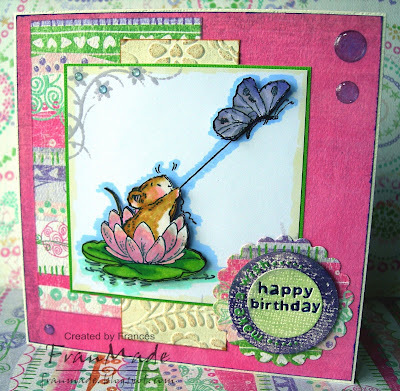 If you pop on over to Katharina's blog there is the chance for a guest DT spot and you'll get to see a sneek peek of one of her stamps. What are you waiting for? Oooo, feel so much better now that I've shared the news :) Can't wait to start! My Blog Candy Winners . . .
. . . are "drum roll please" (I used Randorm.org). Congratulations girls! If you could email me your address I will get your candy out to you either tomorrow or most likely Monday. Thank you all very much for taking part, I can't believe quite how many did take part and from all over the world too! I will try and post some cards this weekend, if not, have a good one. 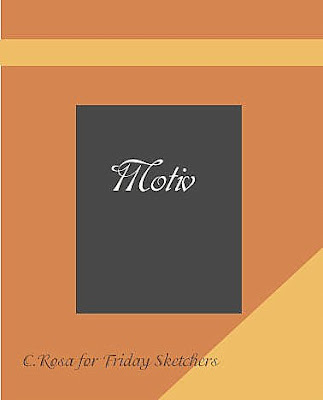 Think I just made it in time for Friday Sketchers. As I wanted a softer look I gave my Promarkers a break and went back to my distress inks for a change. All the lovely flowers and gold metal embellies and button were from the lovely candy I got from Camilla :) The grainy look to the photo is actually the twinkling of the H2O I used - it really shimmers IRL but impossible to capture on photo. You might see it more if you click and zoom in on it. Right, might try and tidy up my craft room as it's looking a tip again! CCT theme this week is 'Animals only, no people allowed' which did actually make me stop and think as I've been engrossed with my Sarah Kays and Magnolias recently! Was going to do a 2 for 1 and use the card I did yesterday (post below this) but then thought I should really do a seperate one. So used 1 of these cute cows I got off Alota stamps the other week (just think they are so funny) and lots of scraps I had laying on my desk. The base card was scrap too hence it's a kick stand card as it wasn't big enough for a normal square card! Here's the card laying flat so you can see the layout better. Hope you'll join in with the challenge. 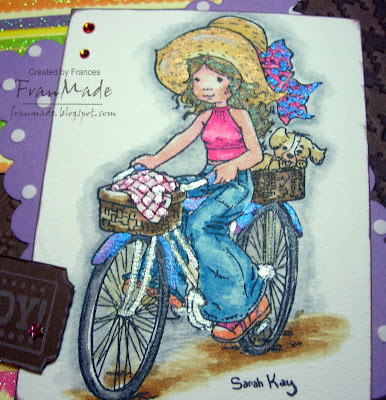 Pop on over to CCT to see all the other fab DT cards to help inspire you and also to see the fab Sarah Kay stamp that can be won if you take part. Yeah, managed to make a card for the PB challenge this week! It was a sketch this week and I love sketches. 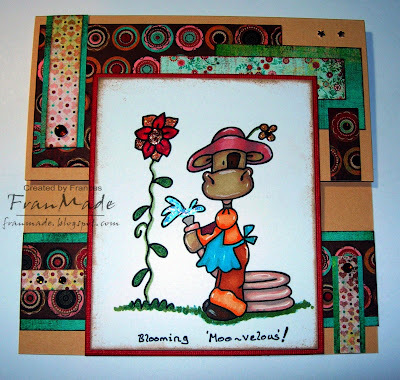 Others: embossing folders for the floral panel and the 'happy birthday' circle scallop nestabilities. Cloud 9 epoxy 'raindots' present from Michelle :) they are fab - will have to find some more! Don't forget, last chance to enter my blog candy by tomorrow, 11pm. I may not get a chance to leave a comment on your blogs but as long as you have posted about my candy and linked back to it then you are entered (If I can't find a link or a post then you're not. Some of you say you have but not left any link to a blog and I don't have time to go hunt them down!) For those that have left comments about not having a blog, sorry - maybe next time ;) I'm sure I'll be doing more candy in future as I have some things in the pipeline ;) but I can't say anything yet! Will announce winners Fri morning, good luck! 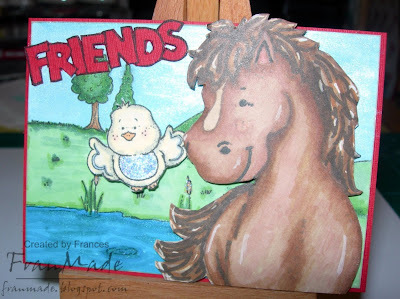 Tilda & friends ATC theme this week is 'Animal Friends'. First things that spring to mind are cats and dogs but I don't have those magnolia stamps (just umpteen other ones!) so thought I'd use my horse magnolia which hasn't seen ink since I got him (a loooong time ago) and gave him a little birdy friend. This was nice and quick one as it was just coloured with promarkers, a little bit of sparkling H2O's and foam pads to raise both birdy and horse. That's all there was to it. 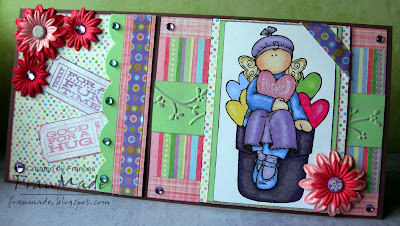 The background stamp is magnolia too and the 'friends' is from one of those studio g 99p clear stamp sets - love those for the little sentiments. Well, as promised, here's my card I started for Ismaki but which will be too late to enter now as there will be new sketch up later today. I loved the sketch as I got a chance to make a DL size card instead of a square one for a change but I actually don't like my finished card that much. Can't quite put my finger on it but it, may be because I like my more muted/distressed colour palette and this is more bright, girly and pastel. Anyway, its done now and am hoping it'll grow on me. I went a bit mad with my adhesive gems too! 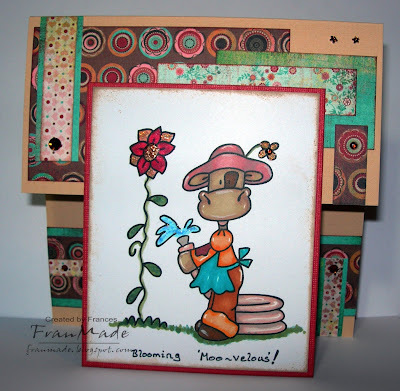 Oh, for those of you who love the Sweet Art Ebony stamps, Funky kits have got the new ones in stock - quick run, as I know they will sell out quick!!! Right best try and get some serious housework done (no really, I can't put it off anymore. Need to give the whole house a thorough seeing to as have family coming to visit next week). So just to warn you, apart from my couple of DT card/ATC I may not be around as much but will try and visit blogs etc when I can. from the lovely Kathy (distressed stamper). 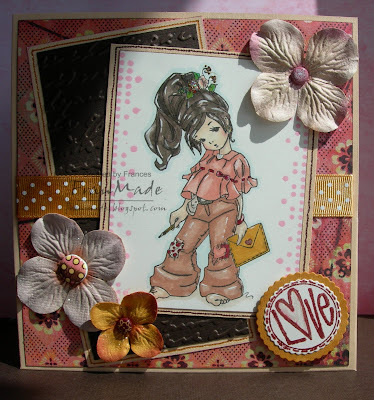 If you don't know her you must pop on over to her blog as she makes the most fab cards. Thank you so much Kathy, it's so nice that you thought of me and means a lot :) There are just too many people I want to give this award to (and some of you have already received this) so rather than just choose 2 I am going to take the short cut and award this one to all my regular visitors, so that would be you - especially if you've read this far! I'm afraid I've not got a card to show you today, just don't know where the weekend has gone plus today is 'hubby day' so never get much time to craft although I did find time to stash shop; unfortunately for my bank balance, my branch of the 'Papermill shop' is stocking PBs (at a VERY good uk price) and more and more stamping stuff these days. The one and only art store I go to has more and more cardmaking stuff too - maybe I have increased their demand soo much they have increased their range LOL). I do have a half finished card for Ismaki which I'll finish and post tomorrow even though it will be too late. There really are just too many challenges that I would like to do but am just having to accept the fact I'm not going to be able to do them all! Talking of challenges, if any of you have any under 16's then why not get them crafting and they can take part in' Crafty Monkey's', fab challenge blog set up by kids for kids. Summer holidays are looming so a great way to keep them occupied for a bit. There's some lovely candy up for grabs too, so well worth a visit. I'm back! 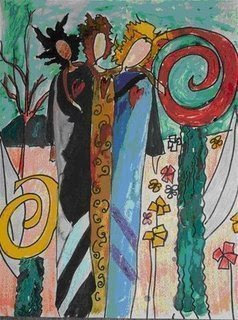 CCT - children's card: 'Groovy baby'! 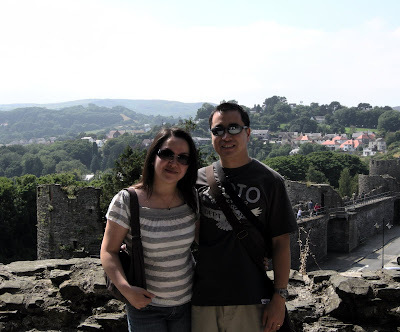 Fab blog candy. . .